We have had several opportunities to observe and participate in different treatment strategies for injured athletes and assist in constructing a rehab program for athletes who have chronic muscle imbalance or tightness. Being able to interact with the athletes, we have the ability to see how well the treatment works, both objectively and subjectively. This is a very interesting aspect of our future profession that we don’t get to address as often in the classroom setting. In class we can measure range of motion (ROM) or girth for our objective results of treatment, however, at our clinical site, we are able to use the athlete’s subjective view to see if he/she feel better after treatments and to see if they feel the treatment is truly effective or not. Having the athletes welcome us so willingly and being so open to letting us practice has really helped us to learn and enhance our skills. 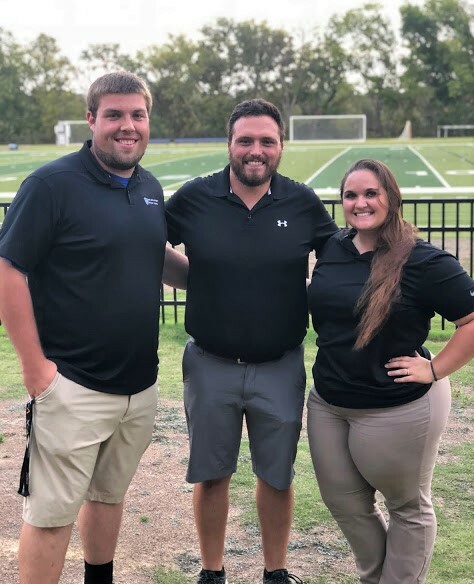 One of the biggest lessons we have learned would be how important organization, communication, and teamwork is within the Athletic Training staff as well as with the athletes, coaches, Athletic Director, and anyone else we encounter. Without those three important ideas, it can become difficult for everyone to be on the same page and understand urgent situations. Planning ahead helps to avoid any gray areas that may arise with miscommunication, whether it be with administration issues or patient injuries and safety. We have to endure some tough decisions, but as an Athletic Trainer, it is important to be firm in our decisions and not let others affect our standard of care.